When Suzuki's engineers get on a roll, there's no holding them back. 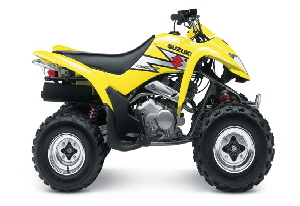 After developing the incredible QuadSport Z400, they knew what they had to do next. Introducing the all-new QuadSport Z250, a sporty lightweight that combines class-leading performance with convenience features that any rider will appreciate. The QuadSport Z250 has the performance characteristics and the range of features to make it the perfect choice for sport riders of varied skill levels. Its four-stroke engine provides smooth torque across the powerband, with top-end performance for real sport excitement. Its chassis and suspension systems are engineered for a combination of maneuverability and comfort. And it's loaded with convenient features such as shaft drive that make it as fun to own as it is to ride. Aggressive-styled bodywork similar to the LT-Z400 - includes high-clearance fenders, performance-inspired graphics and vertically-mounted halogen headlight. Wide, T-shaped seat combines comfort with a functional shape that allows the rider to easily shift his/her weight. Single 30/30W, body-mounted halogen headlight provides and exciting look and bright illumination - large 5/21W tailight/brake light combination is standard. Rugged streel-tube frame with standard steel skid plate and tube-type bumper. Independent double A-arm front suspension with preload-adjustable oil-damped shock absorbers - provides 6.1 inches of wheel travel for a comfortable ride over all types of terrain. Swingarm-type rear suspension features single shock absorber with five preload adjustments and 6.1 inches of rear wheel travel, plus 8.7 inches of ground clearance. Lightweight aluminum wheels and rugged tires (F: 22x7-11, R: 20x10-9), for high style and traction under a wide variety of terrain conditions. Serrated-type footpegs for high grip and comfort with additional built-in mudguard protection. Convenient, 5-liter water-resistant storage box. large 2.8 gallon fuel tank with vacuum-operated fuel petcock. Single cylinder, SOHC, air-cooled, 4-stroke engine designed to produce a smooth, wide, usable powerband. Power is enhanced by a Mikuni BSR 29mm carburetor mated to a large capacity airbox and a specially tuned exhaust system. Convenient electric start system and CDI ignition are powered by compact maintenance-free battery with 150 watt charging system. Five-speed transmission with automatic clutch includes an easy-to-use reverse gear system - place the transmission in neutral - turn the fender-mounted knob and depress the shift lever.